Spring has finally sprung and I am PUMPED! With all of the rain we had in Los Angeles this Winter, all of the flowers are in bloom and trees that are normally a dull brown are full of brand new bright green leaves. A new season also brings a whole new crop of produce to the Farmer’s Market, and fresh new recipes to the blog! So dust off the grill and wake it from its Winter slumber. It’s time to fire it up, and make these grilled artichokes with lemon aioli. Artichokes are one of my favorite Spring vegetables. While they are available year-round, the peak season is really March through May. When choosing artichokes, feel for a firm texture, and look for tight leaves. They should be a deep olive green. They may even have a purple hue in places. Artichokes take a little bit of work to trim and cook, but the result is always worth the extra effort! Artichoke leaves have a tiny little thorn on the end, so they need to be trimmed prior to cooking. 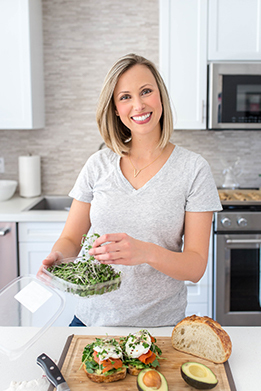 Carefully chop off about 1/2 – 3/4 inch off the top. Then using cooking shears, trim 1/4 inch from the top of each leaf. Trim the stem to about 1 inch or remove all together for a flat bottom. I also like to slightly open the leaves so they cook a little easier. The secret to really flavorful artichokes is seasoning the water they are boiled in. Adding a generous teaspoon of Kosher salt, peppercorns, whole garlic cloves and lemon makes ordinary artichokes to extraordinary. The time it takes for the artichokes to cook depends on their size. Smaller artichokes will obviously take less time, so it is important to check on them as they cook. You can test if they are done by pulling off a few outer leaves. If they release easily, and the end of the leaf is tender, they are done. While the artichokes are cooking, you can prepare the aioli. I love a really light dipping sauce with my artichokes, so I use half mayonnaise and half greek yogurt. The yogurt adds a subtle tang and a rich creaminess without feeling heavy. I love this dipping sauce because you can throw it all in a food processor or blender and season to taste. 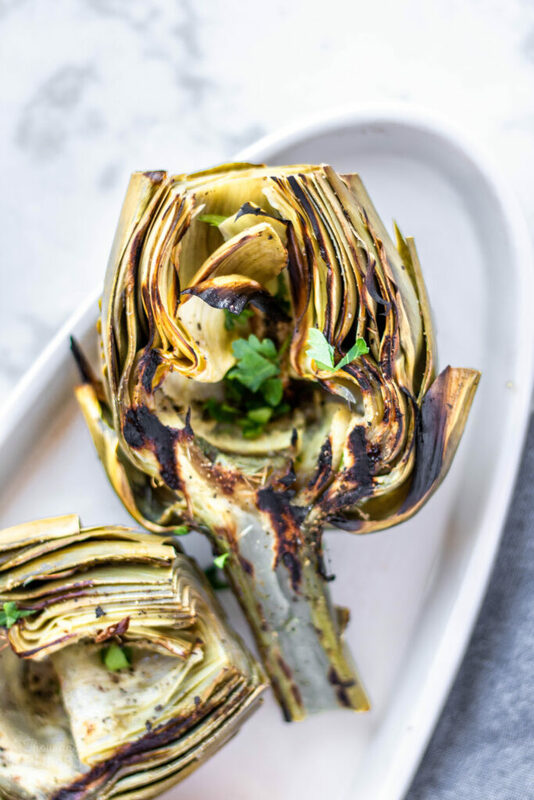 It is easy to make, but adds so much to these grilled artichokes. I like to make the dipping sauce ahead of time and store it in the fridge to give the flavors a chance to develop. When the artichokes are done cooking, carefully drain any excess water and cut them in half lengthwise. The inside will have a fuzzy part and some poky leaves. Carefully scoop out this part, making sure to leave the soft heart towards the top of the stem. Oil both sides of the artichoke and season the flat side with a sprinkling of salt and pepper. Start grilled artichokes with the flat side up – this will help keep the leaves intact and make for an easier flip. Grilling them gives them a crispier texture and a wonderful deep flavor. 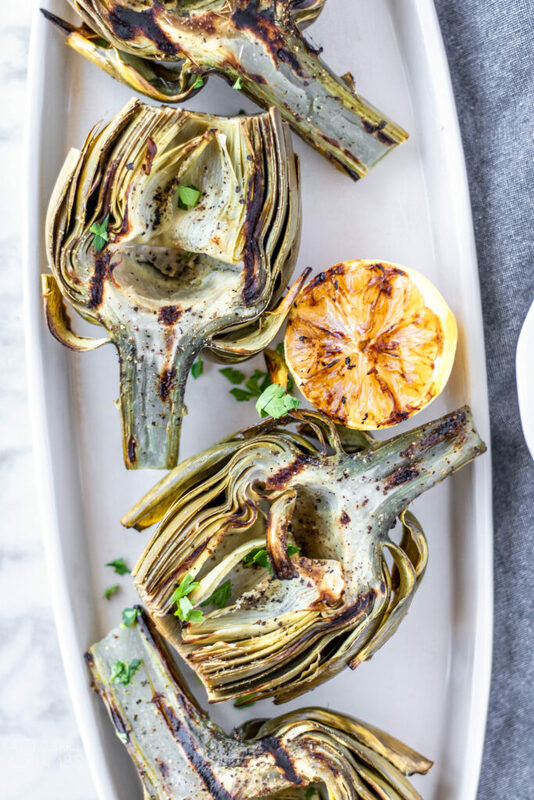 Once you try these grilled artichokes with lemon aioli, you will never want artichokes another way again! 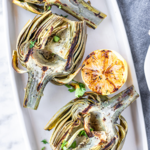 Delicious grilled artichokes with a zesty lemon garlic dipping sauce. A beautiful artichoke appetizer or side dish. Use a small food processor to blend together the mayonnaise, Greek yogurt, lemon zest, lemon juice, garlic, salt, pepper, and red pepper flakes. Process for 10-20 seconds. Taste, and adjust flavor to your taste. Transfer to a small bowl and keep in the refrigerator until ready to use. Prep the artichokes by trimming the stem and cutting the tops off of the outer leaves. Set aside. Bring a large pot of water to a boil. Add 1 Tbsp kosher or sea salt, peppercorns, garlic cloves and lemon halves, squeezing lemon juice into pot before dropping them in. Add whole artichokes, reduce heat to medium, and bring the water back to a simmer before covering, and cook about 35-45 minutes, or longer depending on size of your artichokes. Artichokes should be tender when done. You can also test if they’re done by pulling off some outer leaves. They should release easily. Carefully remove the artichokes from the water and drain any excess water. Carefully cut them in half lengthwise, and scoop out the pokey choke center. Drizzle the halves with olive or avocado oil, and season with salt and pepper. Heat grill to medium-high. Grill artichokes, flat sides up for about 4 minutes, or until golden brown and lightly charred on one side. Turn and cook an additional 4 minutes or until grill marks appear. Sprinkle halves with parsley for garnish and serve with dipping sauce.